The vocabulary defined in this document is also available in these non-normative formats: RDF/XML and Turtle. This document was published by the Government Linked Data Working Group as a Note. If you wish to make comments regarding this document, please send them to public-gld-comments@w3.org (subscribe, archives). All feedback is welcome. The only changes made since the previous version of this document concern the acknowledgement section. No substantive changes have been made. ADMS, the Asset Description Metadata Schema, is a profile of DCAT [ DCAT ] for describing so-called Semantic Assets (or just 'Assets'), that is, highly reusable metadata (e.g. xml schemata, generic data models) and reference data (e.g. code lists, taxonomies, dictionaries, vocabularies) that are used for eGovernment system development [ TOGD ]. Someone searching for an Asset is likely to have different needs, priorities and expectations than someone searching for a dataset in a data catalog and these differences are reflected in ADMS. In particular, users seeking an Asset are likely to be searching for a document — something they can open and read using familiar desktop software, as opposed to something that needs to be processed. Of course this is a very broad generalization. If a code list is published as a SKOS Concept scheme then it is both an Asset and a dataset and it can be argued that all Assets are datasets. Therefore the difference in user expectation is at the heart of what distinguishes ADMS as a profile of DCAT. A further distinction between DCAT and ADMS can be made in that DCAT is designed to facilitate interoperability between data catalogs , i.e. the catalog itself is at the heart of the vocabulary. ADMS is focused on the assets within a catalog. The key words must , must not , required , should , should not , recommended , may , and optional in this specification are to be interpreted as described in [ RFC2119 ]. it does not use terms from other vocabularies instead of ones defined in this vocabulary that could reasonably be used (use of such terms in addition to ADMS is permissible)..
may use only a subset of ADMS terms. specific concrete protocols, formats, and syntaxes. ADMS is technology-neutral and a publisher may use any of the terms defined in this document encoded in any technology although RDF and XML are preferred. The namespace for ADMS is http://www.w3.org/ns/adms# . However, it should be noted that ADMS makes extensive use of terms from other vocabularies, in particular Dublin Core [ DC11 ]. It re-uses and subclasses DCAT wherever possible and therefore defines a minimal set of classes and properties of its own. A full set of namespaces and prefixes used in this document is shown in the table below. ADMS is intended as a model that facilitates federation and co-operation. Like DCAT, ADMS has the concepts of a repository (catalog), assets within the repository that are often conceptual in nature, and accessible realizations of those assets, known as distributions. An asset may have zero or multiple distributions. As an example, a W3C namespace document can be considered to be a Semantic Asset that is typically available in multiple distributions, typically one or more machine processable versions and one in HTML for human consumption. An asset without any distributions is effectively a concept with no tangible realization, such as a planned output of a working group that has not yet been drafted. ADMS is an RDF vocabulary with an RDF schema available at its namespace http://www.w3.org/ns/adms . The original ADMS specification published by the European Commission [ ADMS1 ] includes an XML schema that also defines all the controlled vocabularies and cardinality constraints associated with the original document. This example provides a quick overview of how ADMS might be used to represent a Semantic Asset Repository and its assets. Examples in this document are serialized in Turtle . dcterms:title "The Exemplary Standards Body Catalog"@en . This assumes that the Exemplary Standards Body is described at http://example.com/data#org . This provides the creation date (line 2), description (line 3), publisher (line 4) and a title (line 5) for the Asset. The status of the Asset is given in line 6 using one of the values made available in the original ADMS specification [ ADMS1 ]. Likewise the type of Asset in line 7. In line 8 we can see that there was a previous version of this asset (Fruit_01) and that the latest version can be found by appending 'Fruit' to the data's root (line 9). A system or service that provides facilities for storage and maintenance of descriptions of Assets and Asset Distributions, and functionality that allows users to search and access these descriptions. An Asset Repository will typically contain descriptions of several Assets and related Asset Distributions. An abstract entity that reflects the intellectual content of the asset and represents those characteristics of the asset that are independent of its physical embodiment. This abstract entity combines the FRBR entities work (a distinct intellectual or artistic creation) and expression (the intellectual or artistic realization of a work) [ FRBR ]. Assets can be versioned. Every time the intellectual content of an asset changes, the result is considered to be a new asset that can be linked to previous and next versions of the Asset. The physical embodiment of an Asset is called an Asset Distribution. A particular Asset may have zero or more Distributions. Assets are included in Repositories using DCAT's dcat:dataset property. A particular physical embodiment of an Asset, which is an example of the FRBR entity manifestation (the physical embodiment of an expression of a work). A Distribution is typically a downloadable computer file (but in principle it could also be a paper document or API response) that implements the intellectual content of an Asset. A particular Distribution is associated with one and only one Asset, while all Distributions of an Asset share the same intellectual content in different physical formats. Distributions themselves are not versioned. If Distribution 1A is the manifestation of Asset 1 and Distribution 2A is the manifestation of Asset 2, a version relationship will be expressed between Asset 1 and Asset 2, not between Distribution 1A and Distribution 2A. For an illustration of two Assets that each have two Distributions (representations in different formats) see the diagram below. Assets are linked to Asset Distributions using DCAT's dcat:distribution property. Even before an Asset is finalized, a description of what it will be can often be made; for example, a description of it can be written, the publisher is already known as is the language. A link to the distribution, the physical document, can only be made when the work is done; until that time, the Asset will have no Distribution associated with it. Some Assets, such as technical specifications, have some characteristics that are related to the intellectual content such as its description, its language and its version, and some characteristics that are related to the file itself such as its location (if its identifier is not a URL), its format and the usage conditions. In such cases, a single entity is both an Asset and an Asset Distribution. Even so, best practice is to assert the Asset → Asset Distribution relationship (i.e. to point to itself) so that queries looking for that relationship will still return a result. It is common for a single work to be expressed in multiple formats. For example, RDF documents are often serialized in RDF/XML, Turtle and triples, each of which would be a discrete Distribution. The classification of an Asset according to a controlled vocabulary, e.g. code list, metadata schema. Use dcterms:type to link an Asset to an Asset Type. A contact point for further information about an Asset. Use dcat:contactPoint to link an Asset to a VCard. Any document that further describes an Asset or gives guidelines for its use. See dcat:landingPage, wdrs:describedby and foaf:page. The technical format in which a Distribution is available, e.g. PDF , XSD etc. See also representation technique , dcterms:format and dcat:mediaType . The country or region to which an Asset or Repository applies, linked using dcterms:spatial . an optional identifier for the agency that manages the identifier scheme. it may also be useful to provide further properties such as dcterms:issued to provide the date on which the identifier was issued. An important point to note is that properties of adms:Identifier are properties of the Identifier, not the resource that it identifies or the agency that issued it. The interoperability level (e.g. legal, organizational, political etc.) of the Asset, linked using adms:interoperabilityLevel . The interoperability level may be taken from a list of levels such as that of the European Interoperability Framework [ EIF2 ]. The time period relevant for an Asset, e.g. for its validity. Linked from a Semanmtic Asset using dcterms:temporal . The time period can be specified using schema:startDate and schema:endDate . The organization making a Repository, Asset or Distribution available, linked using dcterms:publisher . The machine-readable language in which a Distribution is expressed. This is more fine-grained than file format , for example "Word 2003", linked using representationTechnique . See also dcterms:format and dcat:mediaType . This concept indicates that one of the files in an Asset Distribution is expressed in the Representation Technique. There may also be other files in the Distribution that are expressed in other Representation Techniques or even files that are not representations at all. An indication of the maturity of an Asset or Distribution, linked using adms:status . The sector that an Asset applies to, e.g. "law" or "environment". Best practice is to use terms from a controlled vocabulary expressed as a SKOS Concept Scheme and linked from the Asset using dcat:theme . A controlled vocabulary that contains terms that are used as Themes for the Assets in a Repository, linked from the Repository using dcat:themeTaxonomy . NB The original ADMS specification supports the provision of a description of the metadata about an Asset, including its publisher and language (i.e. the human language in which the metadata is expressed, irrespective of the language used in the Asset itself). The DCAT concept of a Catalog Record can be used for this purpose and so is not detailed in this document. In the following sub-sections, we set out the properties and relationships (object type properties) used in ADMS. These are listed in alphabetical order, irrespective of namespace. Any kind of URL that gives access to an Asset Repository or Asset Distribution, e.g. a landing page, download, feed URL, SPARQL endpoint etc. Use dcat:accessURL when you do not have information on which it is or when it is definitely not a download. the value is a URL. If the distribution(s) are accessible only through a landing page (i.e. direct download URLs are not known), then the landing page link should be duplicated as accessURL on a distribution (see also dcat:landingPage ). An alternative name for the Asset. Links an asset to a contact point from where further information about an Asset can be obtained. Used to link an Asset Repository to an Asset. A description of the Asset, Asset Repository or Asset Distribution. Links an Asset to an implementation in a particular format. This is a direct link from an Asset Distribution to a downloadable file in a given format, e.g. CSV file or RDF file. The format is described by the distribution's dcterms:format and/or dcat:mediaType. Used in ADMS to define the end of a period of time during which an Asset is valid or applicable. Range rdfs:Literal which should be typed, typically with xsd:date . The file format of the distribution. Usage note dcat:mediaType should be used if the type of the distribution is defined by IANA . Suitable values for dcterms:format include URIs as used in the example . See also adms:representationTechnique . Links a resource to an adms:Identifier class. An Asset that is contained in the Asset being described, e.g. when there are several vocabularies defined in a single document. The interoperability level for which the Asset is relevant. Date of formal issuance (e.g., publication) of the Asset, Asset Repository or Asset Distribution. A word, phrase or tag to describe the Asset. A Web page that can be navigated to in a Web browser to gain access to the Asset, its distributions and/or additional information. Usage note If the Asset Distribution(s) are accessible only through a landing page (i.e. direct download URLs are not known), then the landing page link should be duplicated as accessURL on a distribution. Resources defined by the Library of Congress ( 1 , 2 ) should be used. If an ISO 639-1 (two-letter) code is defined for language, then its corresponding IRI should be used; if no ISO 639-1 code is defined, then IRI corresponding to the ISO 639-2 (three-letter) code should be used. A link to the current or latest version of the Asset. Links to the conditions or restrictions for (re-)use of the Asset Distribution. Usage note If multiple licenses are given, these licenses apply to all files in the Asset Distribution. The media type of the distribution as defined by IANA . Usage note This property should be used when the media type of the distribution is defined in IANA , e.g. text/csv otherwise dcterms:format may be used with different values. See also adms:representationTechnique . Date of the latest update of the Asset, Asset Repository or Asset Distribution. A link to the next version of the Asset. Range rdfs:Literal which should be typed. A link to the previous version of the Asset. Links an Asset, Asset Repository or Asset Distribution to the publishing foaf:Agent. Links to documentation that contains information related to the Asset. A link between two Assets that are related in some (unspecified) way. More information about the format in which an Asset Distribution is released. This is different from the file format as, for example, a ZIP file (file format) could contain an XML schema (representation technique). Usage note See also dcterms:format and dcat:mediaType . Links to a sample of an Asset (which is itself an Asset). The name of the agency that issued the identifier. The geographic region to which the Asset or Asset Repository applies. Used in ADMS to define the start of a period of time during which an Asset is valid or applicable. The status of the Asset in the context of a particular workflow process. 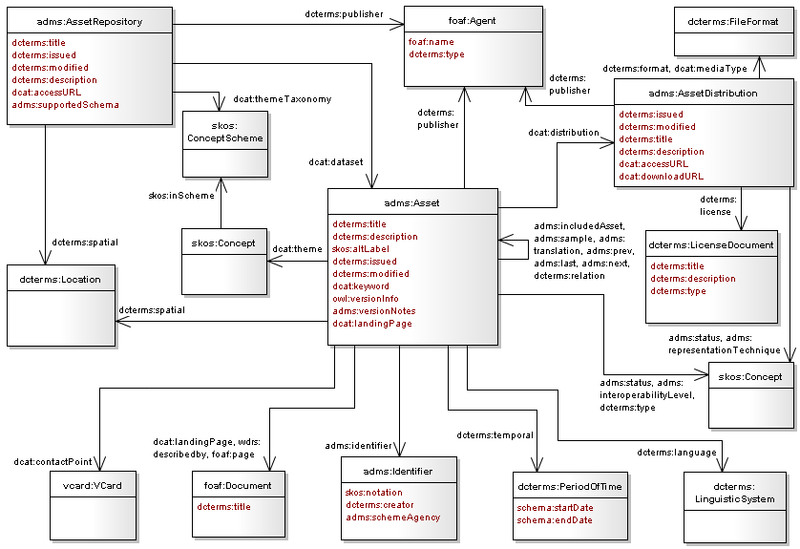 A schema according to which the Asset Repository can provide data about its content, e.g. ADMS. The time period to which the Asset applies, e.g. its validity. The theme or sector to which the Asset applies. The SKOS Concept Scheme used to classify an Asset Repository's assets. A name given to the Asset, Asset Repository or Asset Distribution. Links Assets that are translations of each other. This property is used to point to the specific type of publisher, Asset and License Document. In each case the type should be provided using a controlled vocabulary encoded as a SKOS Concept. Range Formally rdfs:Resource but skos:Concept should be used. A version number or other designation of the Asset. A description of changes between this version and the previous version of the Asset. ADMS was first developed by and published by the European Commission ISA Programme. Contributors included representatives of Member States of the European Union, operators of national repositories, standardization bodies and independent experts whose work was published in April 2012 [ ADMS1 ]. That document includes the history and motivation behind the development of ADMS, as well as the business need and usage scenario for it. Further development and review has been undertaken by the Government Linked Data Working Group (GLD WG). This version of ADMS builds on the original work in a broader, global context. It also includes some changes to the original version made as a result of implementation experience, particularly on the European Commission's Joinup Platform. European Interoperability Framework (EIF) for European public services (PDF) European Commission. URL: http://ec.europa.eu/isa/documents/isa_annex_ii_eif_en.pdf.